Sidewalk Games For a craft project, make simple chalk drawings on construction paper, using sidewalk chalk. Or, if you have some outdoor space available, set up some simple sidewalk games such as hopscotch, hide and seek, tag, or jump rope. Ashdown, Rebecca. Bob and Flo Play Hide and Seek. Two penguin friends play games at preschool. Barrow, David. Have You Seen Elephant? 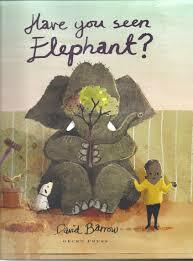 Readers will find the elephant before the boy in the story does, in this imaginative tale. Chase, Kit. Oliver’s Tree. Oliver the elephant can’t really hide behind a tree but still enjoys outdoor games. Gravett, Emily. Bear & Hare – Where’s Bear? Counting is a skill needed to play hide and seek making this a fun story with a learning element. Long, Ethan. Lion & Tiger & Bear: Tag, You’re It! Lion wants to paint a picture but his friends try to get him to join their game of tag. Merz, Jennifer. Playground Day! In this rhyming story, a little girl plays on the playground equipment. O’Neill, Alexis. The Recess Queen. Mean Jean is the playground bully who challenges others to a jump-rope contest. Siddals, Mary. Bringing the Outside In. Four children show how much fun it can be to play outside, no matter what the season. Walton, Rick. Girl & Gorilla: Out and About. The title characters go to the park to play. Wohnoutka, Mike. Little Puppy and the Big Green Monster. A puppy attempts to get a monster to play tag and hide and seek.